Traditionally, the market for country houses in the south of England has been driven by London families leaving the capital in search of a better choice of schooling for their children and a generally less frenetic way of life. But the ever-widening gap between house prices in central London-still rising on the back of a seemingly endless flow of foreign money-and recession-hit prices in the country has led many families who have sold well in central London to hedge their bets by buying in areas such as Wimbledon, Richmond and Chiswick, rather than making ‘the big move’ to the country. Fortunately for the health of the country-house market, two very influential groups of London buyers continue to buck the trend. 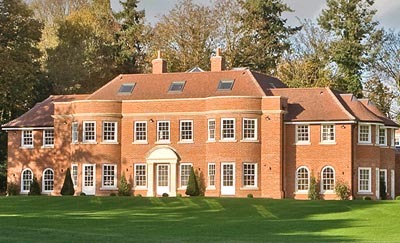 The first are the international high-flyers who prefer to maintain a discreet presence within the exclusive private estates of north Surrey and Berkshire, close to transport hubs such as Heathrow, Gatwick and Farnborough private airport, and schools such as Eton and Wellington, or the American Community School at Cobham. The second group, affectionately dubbed ‘Fulham farmers’ by their city-bred neighbours, are families with young children who have done their stint in areas of south-west London such as Battersea, Clapham and Wandsworth, and can now profit from the price gap to re-establish their roots in commutable areas of Surrey, Sussex, Hampshire and the Cotswolds. Surrey born-and-bred Nigel Carande of niche developer Willowmead, based in Petersfield, has catered for the ‘high-risk, high-reward’ top end of the market in Surrey, West Sussex and Hampshire since 1979, building a handful of classic country houses each year on carefully chosen sites. ‘Clearly, this is a buyer’s market, where quality is an insurance policy, so we’re incredibly fussy about what and where we build,’ says Mr Carande, whose firm has established a winning partnership with Arundel-based Neil Holland Architects in the past decade, creating a string of prestigious, ‘bling’-free country houses in Queen Anne, Georgian and Arts-and-Crafts styles. Willowmead’s latest offering is the newly launched Burleigh House (pictured) at Burhill, between Cobham and Weybridge, in Surrey, for which Savills (01932 838000) quote a guide price of £6.5 million. Built on the site of a dilapidated former farmhouse in the ‘wide-shouldered’ Georgian style favoured by wealthy Britons and foreigners alike, Burleigh House stands in 31⁄2 acres of idyllic landscaped grounds overlooking the fourth fairway of the Old Course at exclusive Burhill Golf Club. Set at the end of a long private drive, the imposing red-brick house has four formal reception rooms, a family-friendly kitchen/breakfast/morning room, sumptuous master and guest suites, four en-suite bedrooms, a gymnasium and a games and media room, as well as a staff flat. There is also planning consent for a luxurious, 4,000sq ft leisure centre. to downsize to a smaller house. Upper Buncton House dates from the late 1700s, and has four main reception rooms, a splendid kitchen/breakfast room, master and guest suites, eight further bedrooms, lovely gardens and grounds and a heated swimming pool. The outbuildings include a 1,120sq ft granary that could be converted to residential use.Today sees the launch in Country Life of elegant Glebe House on the edge of unspoilt Crawley village, halfway between the cathedral city of Winchester and the Test Valley town of Stockbridge. Strutt & Parker (01962 869999) quote a guide price of £2m for the house, built in about 1910 by the workers of the Crawley Court estate, to replace the original rectory. The house has been lovingly maintained by its present owner, who bought it with her late husband in 1974, but now wishes to downsize. Set in 11⁄2 acres of gardens, it has accommodation on three floors, including three main reception rooms, a conservatory, a kitchen/breakfast room, five bedrooms and three bathrooms. Over the years, Hampshire’s tranquil Meon Valley has been a favourite refuge of well-connected City bankers, who are still considered a good risk by mortgage lenders, says James Grillo of Chesterton Humberts (020-7594 4746). His biggest problem these days is a shortage of sensibly priced properties. One that should meet the requirements of most sensible bankers is historic, Grade II-listed Hinton Manor, near Catherington, seven miles from Petersfield, for which the agents quote a guide price of ‘excess £2m’. The manor, which dates from 1296, has evolved over the centuries and been extensively renovated by the vendors in recent years. It stands on high ground in a delightful rural setting between the villages of Catherington and Clanfield, six miles from the A3 and close to schools such as Bedales, Churchers College and Ditcham Park. It has six main reception rooms, a kitchen/breakfast room, five bedrooms, four bathrooms and a separate cottage. Grounds of 4.4 acres include a swimming pool, a lake and garaging. But nowhere is the shortage of country houses being more keenly felt than in the Cotswolds, where people who buy are usually reluctant to move, unless they need to downsize. That’s the scenario behind the sale of handsome, early-18th-century The Old Rectory at Elkstone, between Cirencester and Cheltenham, for which Strutt & Parker (01285 627683) quote a guide price of £3.25m. Built as the rectory to Elkstone’s Norman church of St John (claimed to be the highest in the Cotswolds), the imposing, four-storey, Queen Anne-fronted house, listed Grade II, was extended by the Gloucestershire architect Francis Niblett in 1847. Its original design may well have been inspired by Sir John Vanbrugh, who was a friend of the then rector; a later incumbent, the Rev Fowle, was a cousin of Jane Austen, another regular visitor. Beautifully renovated by its present owners, the Old Rectory has three main reception rooms, an orangery, seven bedrooms, three bath/shower rooms, a cottage and 11 acres of gardens and grounds, with extensive equestrian facilities including a larger-than-Olympic outdoor manège.